The Sheldon Jackson Museum’s April Artifact of the Month is a pair of Athabascan moccasins (SJ-IV-X-65A,B). They were collected by Reverend John White, who was given the footwear by Hudson Stuck, Archdeacon of the Yukon. The moccasins were later passed on to William H. White who donated the moccasins and twenty-five other artifacts to the Sheldon Jackson Museum in memory of Reverend White in November of 1995. 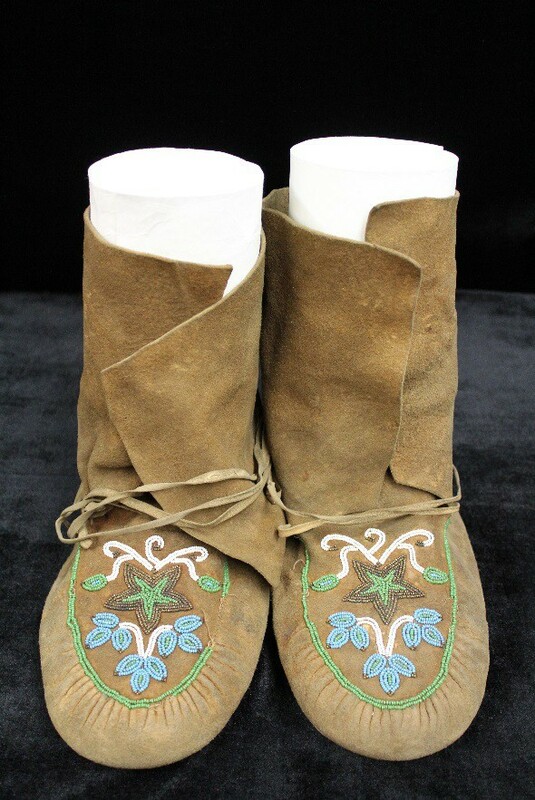 The April Artifacts of the Month are interesting not only for their association with a well-known figure in Alaska’s history but also because they are the only Yukon-Tanana style moccasins in the museum’s collection. Hudson Stuck, social reformer, Episcopal clergyman, and author of many periodicals and five books, is best known for his missionary activities in Alaska and for being among the first to successfully climb to the top of Denali. Stuck was born in London, England on Nov. 11, 1865. After attending King’s College, he moved to Texas where he worked as a cowboy and a teacher for four years until he began studying theology at the University of the South in Sewanee, Tennessee. He was ordained a priest in 1892 and proceeded to write articles and give sermons on everything from lynching and gun control to the need for recreational areas. His activism focused on a myriad of social issues and culminated in the founding of a night school for millworkers, a home for indigent women, a home for orphaned children, and contributed to the passage of the first law in Texas to curb child abuse. Desirous of new challenges, Stuck moved to Alaska in 1904 where he became the Archdeacon of the Yukon and the Arctic – a land area approximately 250,000 miles in size. He travelled year round using dogsled in the winter and boats in the warmer months, delivering sermons to miners, woodcutters, and Alaska Natives. In 1913, he co-organized and co-led the first successful ascent up Denali. On Oct. 10, 1920, after a long adventurous life, Stuck passed away from pneumonia in Fort Yukon. Based on an inscription on a white cloth commercial tag that was attached to one of the two moccasins at the time they were donated to the museum, the footwear was given to Reverend John White, by Stuck who had “travelled ‘mushed’ in them.” Based on the handwritten inscription and the fact that Reverend White was the rector of St. Mary’s Episcopal Church in Nome from mid-1903 until mid-1906, it is highly likely that Stuck collected the moccasins during his first few years in Alaska. The April Artifact(s) of the Month are made of smoked moose hide, have large vamps, rounded toes, high ankle flaps, and t-shaped heel seams. The moccasins themselves are sewn with sinew and the beadwork is thread sewn. They are unevenly soiled on the interior, showing possible signs of use-related wear, and have been slightly altered. A piece of commercially tanned leather has been recycled and sewn to the exterior of the soles, but it is unknown when or by whom. There have also been draw string cords added at some point. The shape and form of the Artifact(s) of the Month are not unique to any region in traditional Athabascan territory, but the beadwork in the vamps gives clues to the likely geographic origin. The couched and spot stitched beadwork in the moccasin vamps features symmetry, contrast, motif, color and media types characteristic of the traditional Yukon-Tanana beading style. Both the limited number of elements and their simplicity and minimal outlining are common to this particular style. The juxtaposition of the star, foliage, and petal or teardrop shapes against the open background emphasize contrast – a hallmark of this region. Many beadwork examples from this area, according to Kate C. Duncan, feature stem designs, especially hair stems, and in this footwear, the stem networks are prominent. The majority of the beading is done in white, green, and teal blue glass seed beads - three of the colors most prominent in Yukon-Tanana beadwork. Both the presence of wisps at the points of the leaves and teardrops and the incorporation of dark, gold-toned metal faceted beads, likely copper alloy, is frequently found in Yukon-Tanana beadwork. The Sheldon Jackson Museum is home to over one hundred Athabascan artifacts. Many of these artifacts and the April Artifact(s) of the Month may be seen during the museum’s operating hours Tuesday through Saturday between 10am and 4pm. The April Artifact of the Month will be on exhibit until April 30th. General admission is $6, $5 for seniors, and free for those 18 and under or members of either the Friends of the Sheldon Jackson Museum or Friends of the Alaska State Museum. The couched technique, it should be noted, is common among all Athabascan regions. Colors used in Yukon-Tanana beadwork are usually dark red, dark green, navy, aqua, teal blue, dusty rose, greasy yellow, and greasy green. White is used more frequently in beadwork from this Athabascan region than others. Generally, designs only have six to ten colors; sometimes fewer. The rosette is the most frequent motif in the Yukon-Tanana style, but other very common motifs include a heart, an unelaborated split bell, tripartite leaf, vertical teardrop, dropping teardrop, a vertical teardrop with wisps at the point.